Microsoft started to roll out Windows 10 build 14951 to PC and Mobile users on the Fast ring. The latest build offered a number of new features and important fixes. However, several users on Mobile reported the update being stuck at “0% Downloading” error. Microsoft has now shared a workaround to fix Windows 10 Mobile build 14951 installation errors. Follow this guide for more details. Fast ring insiders trying to update to the latest Windows 10 Mobile build 14951 reported getting stuck at zero percent during the download process. 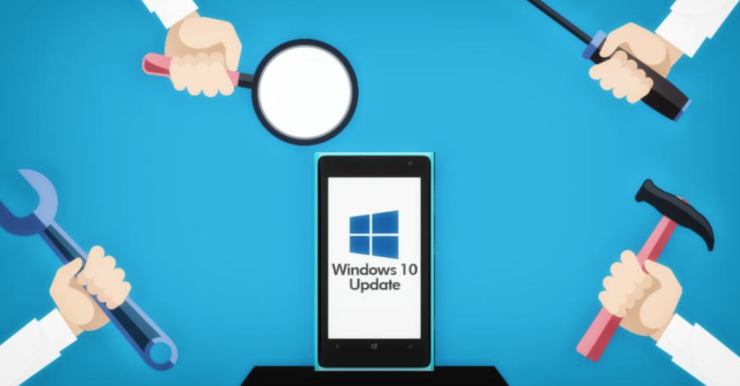 The company acknowledged the problem and confirmed that only the users on Windows 10 Mobile build 14946 are experiencing this problem. Microsoft’s Jason has now shared some workarounds that the Windows engineering team is working on to fix the installation issues. Follow these (somewhat long) steps to fix Windows 10 Mobile 14951 installation issues. Plug your device into a charger. Open Settings > Update & Security Windows> Insider Program. Change your device to “Slow” ring, and then back to “Fast“. Turn on airplane mode: Settings > Network & wireless > Airplane Mode. Go to Settings > Time & Language > Date & Time. Disable Set date and time automatically. Change the date to 7 days in the future. Return to the home screen and reboot your phone. After the reboot, open Settings to turn off the Airplane Mode. Go to Settings > Update & Security > Phone update > Check for updates. This process will fail with an error code, which is expected! Change the device date back to the current date: Settings > Time & Language > Date & Time. Check for updates again: Settings > Update & Security > Phone update > Check for updates. This check may fail, which is – again – expected. Finally, the real step: Settings > Update & Security > Phone update > Check for updates. Now, the Windows 10 Mobile build 14951 should start to download. Even after the tedious process shared above, Microsoft has shared that the company has seen “several instances of users reporting” an error code 80242006 after the above workaround. If you do receive this error code, follow these steps to fix the problem. Change your device to “Slow” >Phone update > Check for updates (this will say you’re up to date to the Slow ring update). Change back to the Fast ring. Check for updates again, and your phone should now update. Don’t want to go through the above process(es)? Well, Microsoft has confirmed that the download will time out automatically after five days. After which you should be able to update to the latest Insider preview build. For more details, please visit the community page. Don’t forget to let us know if the above workaround helped you fix Windows 10 Mobile build 14951 installation problems.